I was born in New Westminster (longer ago than I care to admit!) and have lived in either the Lower Mainland or Vancouver city my whole life. I know my way around and have an excellent knowledge of the many diverse areas that make up our unique communities. This means that if you want to sell your townhouse in Burnaby and buy a family house in Coquitlam, or sell your Vancouver property and move to an estate acreage in Langley I can help you with all that. You don't have to change agents! 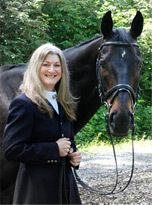 I am also a lifelong horse person and competitive equestrian with extensive contacts in the equine industry, so if you are looking to buy or sell a horse property, I speak your language! Before I decided to pursue my passion for Real Estate I worked in health care for 18 years. Real Estate can be a minefield and it really helps to have someone you can trust to help you through. I approach it the same way I used to help patients navigate the complexities of the health care system. Be educated, listen carefully, put myself in their shoes, then do everything I can to attain a successful outcome. Helping people is what it's all about! I think my clients appreciate my honest and straightforward approach, as well as patience and a sense of humor. Buying or selling your home can be stressful, let me help to make it less so. Please feel free to contact me at any time. I am always happy to answer any questions or update you on what is happening in the market.